One of the reasons I love working with Vue is because of how useful methods, computed, and watchers are, and the legibility of their distinction. Until understanding all three, it’s difficult to leverage the functionality of Vue to its full potential. Still, the majority of people I see confused about this framework tend to also be confused about the differences here, so let’s dig in. Methods: These are exactly what they sound like they might be (yay, naming!). They’re functions that hang off of an object—typically the Vue instance itself or a Vue component. Computed: These properties may at first look like they’d be used like a method, but are not. In Vue, we use data to track changes to a particular property that we’d like to be reactive. Computed properties allow us to define a property that is used the same way as data, but can also have some custom logic that is cached based on its dependencies. You can consider computed properties another view into your data. Watchers: These are allowing you a peek into the reactivity system. We’re offered some hooks with which to observe any properties that are stored by Vue. If we want to add a bit of functionality each time something changes, or respond to a particular change, we could watch a property and apply some logic. This means that the name of the watcher has to match what we’re trying to observe. Methods are likely something you’re going to use a lot while working with Vue. They’re aptly named as, in essence, we’re hanging a function off of an object. They’re incredibly useful for connecting functionality to directives for events, or even just creating a small bit of logic to be reused like any other function. You can call a method within another method, for example. You can also call a method inside a lifecycle hook. They’re very versatile. See the Pen Slim example of methods by Sarah Drasner (@sdras) on CodePen. We could have also executed the logic in the directive itself like <button @click="message = Date()">Try Me</button>, which works very well for this small example. However, as the complexity of our application grows, it’s more common to do as we see above to break it out to keep it legible. There’s also a limit to the logic that Vue will allow you to express in a directive—for instance, expressions are allowed but statements are not. You may notice that we’re be able to access this method within that component or Vue instance, and we can call any piece of our data here, in this case, this.message. You don’t have to call a method like you’d call a function within a directive. For example, @click=”methodName()” is unnecessary. You can reference it with @click=”methodName”, unless you need to pass a parameter, such as @click=”methodName(param)”. There are many more, here are just a few. Computed properties are very valuable for manipulating data that already exists. Anytime you’re building something where you need to sort through a large group of data and you don’t want to rerun those calculations on every keystroke, think about using a computed value. Computed properties are a vital part of Vue to understand. They are calculations that will be cached based on their dependencies and will only update when needed. They’re extremely performant when used well and extraordinarily useful. There are many large libraries that handle this kind of logic that you can now eliminate with only a few lines of code. Computed properties aren’t used like methods, though at first, they might look similar- you’re stating some logic in a function and returning- but the name of that function becomes a property that you’d then use in your application like data. See the Pen Filter a list with Computed- start by Sarah Drasner (@sdras) on CodePen. Now let’s create a filter for those names. We’ll start by creating an input with v-model that will originally be an empty string, but we’ll eventually use to match and filter through our list. We’ll call this property findName and you can see it referenced both on the input and in the data. Now, we can create the computed property that will filter all of the names based on what the user has typed into the input, so anything in our findName property. You’ll note that I’m using regex here to make sure that mismatched capitalization doesn’t matter, as users will typically not capitalize as they type. And it filters for us on every keystroke! We only had to add a couple of lines of code to make this work, and didn’t have to load any additional libraries. See the Pen Filter a list with Computed- end by Sarah Drasner (@sdras) on CodePen. I can’t tell you how much time I save by using them. If you’re using Vue and haven’t explored them yet, please do, you’ll thank yourself. Vue has nice abstractions, and anyone who has been a programmer for a while will usually tell you that abstractions can be a pain because you’ll eventually get to a use case they can’t solve. However, this situation is accounted for, because Vue grants us some deeper access to into the reactivity system, which we can leverage as hooks to observe anything that’s changing. This can be incredibly useful because, as application developers, most of what we’re responsible for are things that change. Watchers also allow us to write much more declarative code. You’re no longer tracking everything yourself. Vue is already doing it under the hood, so you can also have access to changes made to any properties it’s tracking, in data, computed, or props, for example. Watchers are incredibly good for executing logic that applies to something else when a change on a property occurs (I first heard this way of putting it from Chris Fritz, but he says he might have also heard it from someone else ☺️). This isn’t a hard rule- you can absolutely use watchers for logic that refers to the property itself, but it’s a nice way of looking at how watchers are immediately different from computed properties, where the change will be in reference to the property we intend to use. Let’s run through the most simple example possible so you get a taste of what’s happening here. As you can see in the code above, we’re storing counter in data, and by using the name of the property as the function name, we’re able to watch it. When we reference that counter in watch, we can observe any change to that property. If the state is similar enough, you can even simply transition the state with watchers. Here’s an example I built from scratch of a chart with Vue. As the data changes, the watchers will update it and simply transition between them. SVG is also good for a task like this because it’s built with math. First we created a dummy object that will get updated by our animation library. Then we have an update function that is invoked on each tween step. We use this to push the data. Then we create an object to hold the source data to be tweened and the function pointer for update events. We could also use animation in watchers to create something like this time difference dial. I travel a bit and all my coworkers are in different areas, so I wanted a way to track what local time we were all in, as well as some signification of the change from daytime/nighttime as well. See the Pen Vue Time Comparison by Sarah Drasner (@sdras) on CodePen. Here we’re watching the checked property, and we’ll fire different methods that contain timeline animations that change the hue and saturation and some other elements based on the relative association to the current time. As mentioned earlier- the change occurs on the dropdown, but what we’re executing is logic that’s applied elsewhere. There are also a number of other interesting things about watchers, for instance: we’re given access to both the new and old versions of the property as parameters, we can specify deep if we’d like to watch a nested object. For more detailed information, there’s a lot of good information in the guide. You can see how watchers can be incredibly useful for anything that’s updating—be it form inputs, asynchronous updates, or animations. If you’re curious how reactivity in Vue works, this part of the guide is really helpful. If you’d like to know more about reactivity in general, I really enjoyed Andre Staltz’ post and the Reactivity section of Mike Bostock’s A Better Way to Code. I hope this was a helpful breakdown on how to use each, and speeds up your application development process by using Vue efficiently. There’s a stat out there that we spend 70% of our time as programmers reading code and 30% writing it. Personally, I love that, as a maintainer, I can look at a codebase I’ve never seen before and know immediately what the author has intended by the distinction made from methods, computed, and watchers. 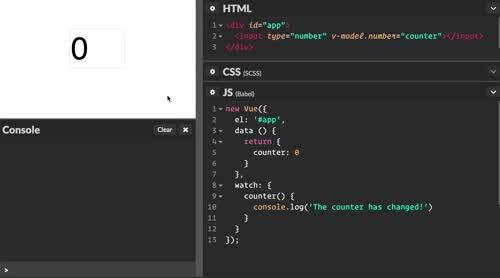 The post Methods, Computed, and Watchers in Vue.js appeared first on CSS-Tricks.